6182 124YDD 6 Pfg. 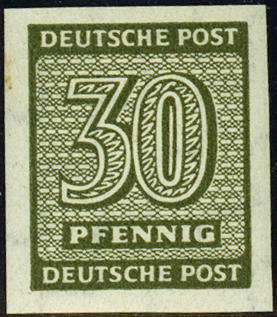 Dark bluish green, increasing watermark, with clear Part double pressure, from right margin of sheet, fresh colors and very well perforated, in perfect condition mint never hinged an extraordinarily scarce variety, the also in the Michel special catalogue due to missing offers only noted without price is. Photo expertize \"genuine and immaculate\" Ströh BPP. 6183 ✉ 126wcY 3 Pfg. 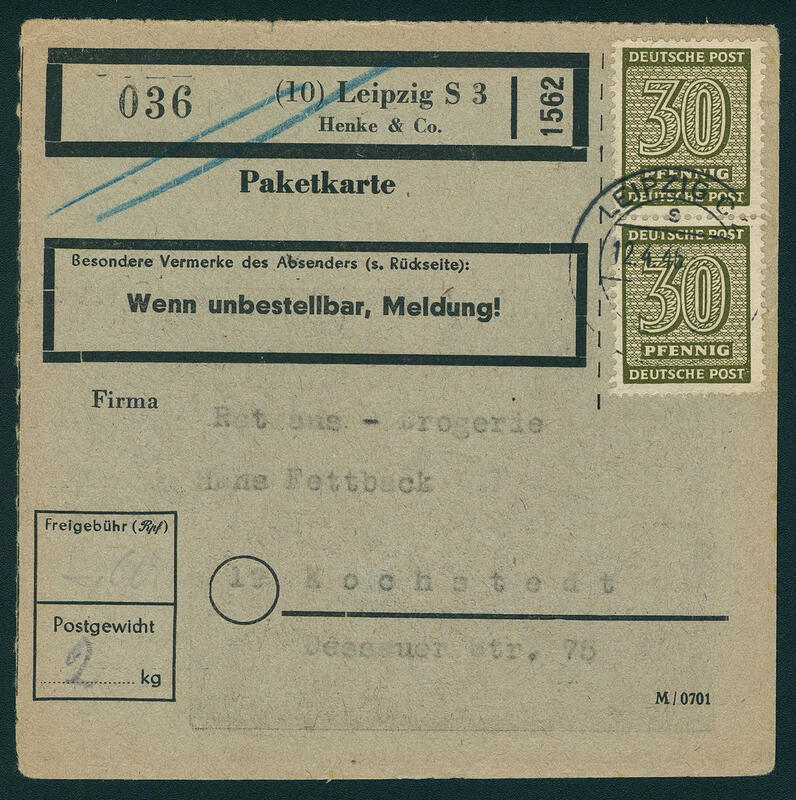 Dark brown ocher, watermark Y, as correctly franked single franking on \"request to the examination one mailing address\" from \"LEIPZIG 9.2.46. \" to Senneberg and again return transported. A very scarce utilization. There are only few documents of this kind from West Saxons have become known! Photo expertize \"genuine and immaculate\" Ströh BPP. 6184 127waXU 4 Pfg. 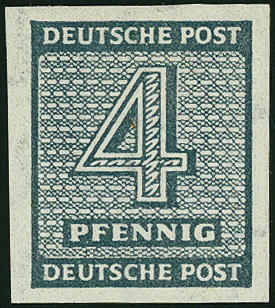 Black gray blue, falling watermark, vertical strip of four from upper margin extremely strong with defective or badly placed perforation, as well the lower stamp unperforated, in perfect condition mint never hinged an extraordinarily decorative varieties combination, in this kind possibly unique! Photo expertize \"genuine and immaculate\" Ströh BPP. 6185 127wbXU 4 Pfg. Dark blue gray, falling watermark, four sides with wide margins unperforated, fresh colors and in perfect condition mint never hinged a spectacular varieties rarity. Unperforated examples of this issue are also in the Michel special catalogue not listed! Photo expertize \"genuine and immaculate\" Ströh BPP. 6186 129wYUo 6 Pfg. 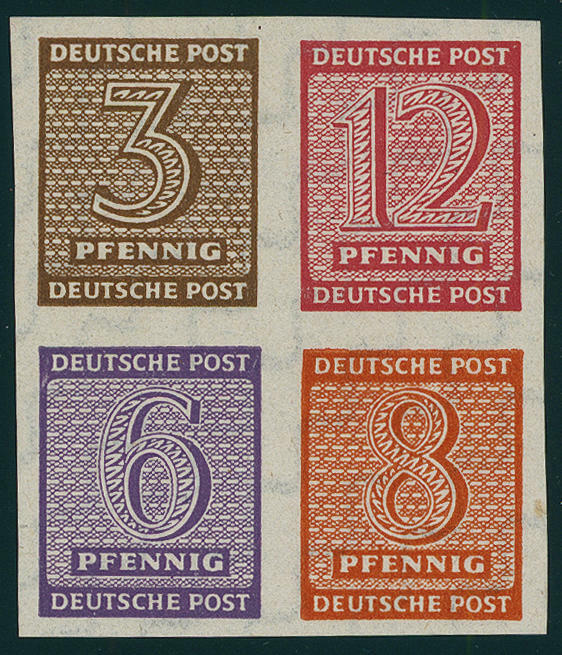 Bright gray violet, increasing watermark, left upper corner of the sheet above unperforated and to the sides partially perforated, fresh colors and in perfect condition mint never hinged an extremely scarce variety, in this kind as corner of the sheet seeming unique! In the Michel special catalogue due to missing offers only noted without price! Photo expertize \"genuine and immaculate\" Dr. Jasch BPP. 6187 ⊙ 129YwUo 6 Pfg. 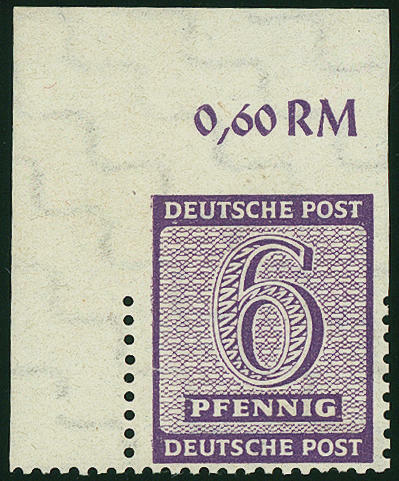 Bright gray violet, above unperforated and vertical partially perforated from the left upper corner, fresh colors and in perfect condition with special cancellation \"LEIPZIG 15.7.46. \". 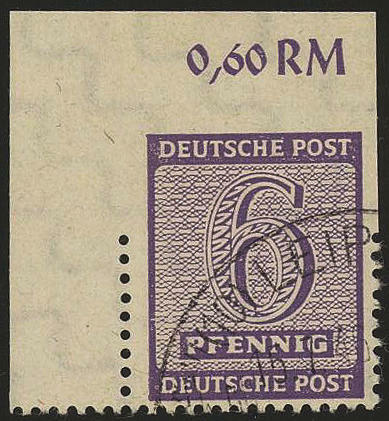 An extremely scarce variety and in this kind as corner of the sheet probable unique! Photo expertize \"genuine and immaculate\" Ströh BPP. 6188 ⊙ 129YwUo 6 Pfg. 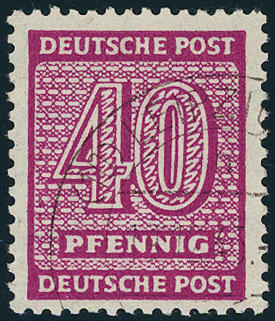 Bright gray violet, vertical pair from upper margin, the upper stamp above unperforated and vertical partially perforated, in perfect condition with special cancellation \"LEIPZIG\". A very scarce variety! Photo expertize \"genuine and immaculate\" Ströh BPP. 6189 ✉ 133wbX 15 Pfg. 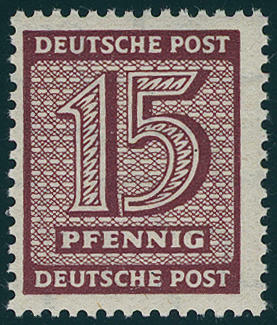 Bright brown carmine, falling watermark, vertical corner margin pair as correctly franked multiple franking on newspaper banderole from \"LEIPZIG 6.8.46. \" in the local usage transported (weight step 250-500 Gram). Newspaper printed matters of this kind to class among the rarities of the SBZ. A top piece for the frankings collector! Photo expertize \"genuine and immaculate\" Ströh BPP. 6190 133Ywb 15 Pfg. 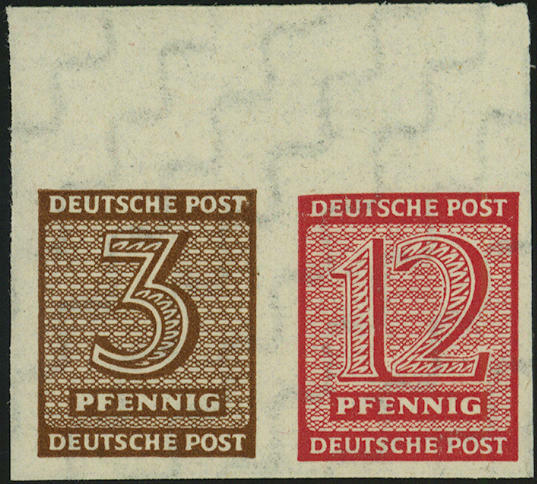 Bright brown carmine, increasing watermark, 15 pieces in perfect condition mint never hinged, all with photo attests \"mint never hinged perfect\" Ströh BPP. Michel 2400,- €. 6191 ✉ 135waY 30 Pfg. 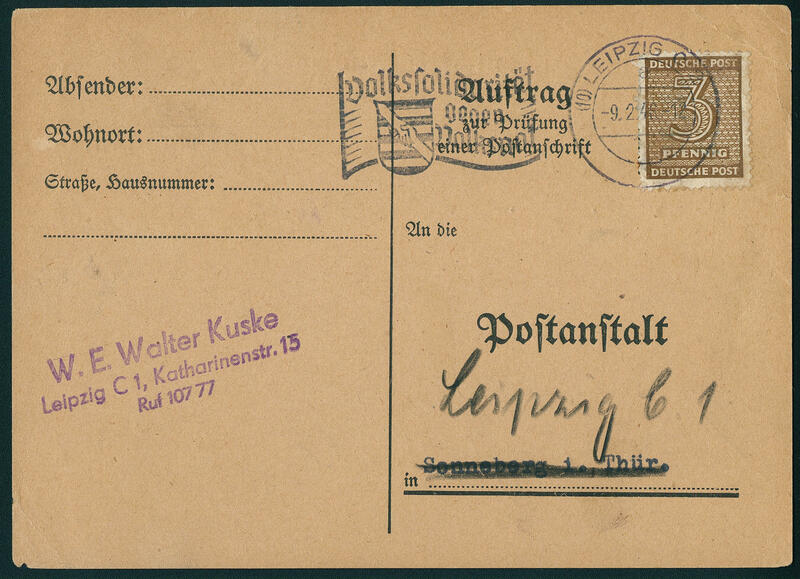 Dark brownish olive, two examples as correctly franked multiple franking on package card from \"LEIPZIG 12.4.46. \" to Kochstedt. Package cards of this kind are very rare. Photo expertize \"genuine and immaculate\" Ströh BPP. 6192 135wbXU 30 Pfg. 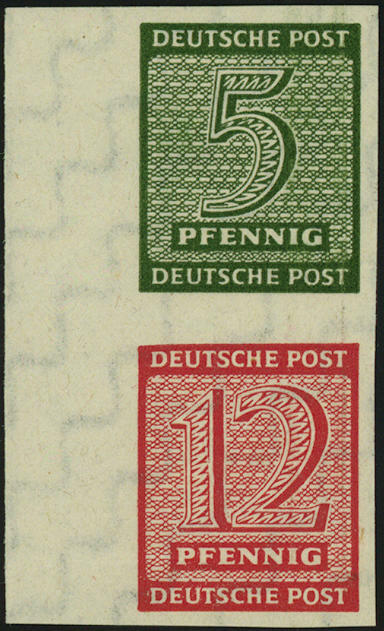 Dark olive, scarce colour unperforated, wonderful fresh colors, large margins all around, in perfect condition mint never hinged, photo expertize \"genuine and immaculate\" Ströh BPP. Michel 1,500.- €. 6193 ⊙ 136wcX 40 Pfg. 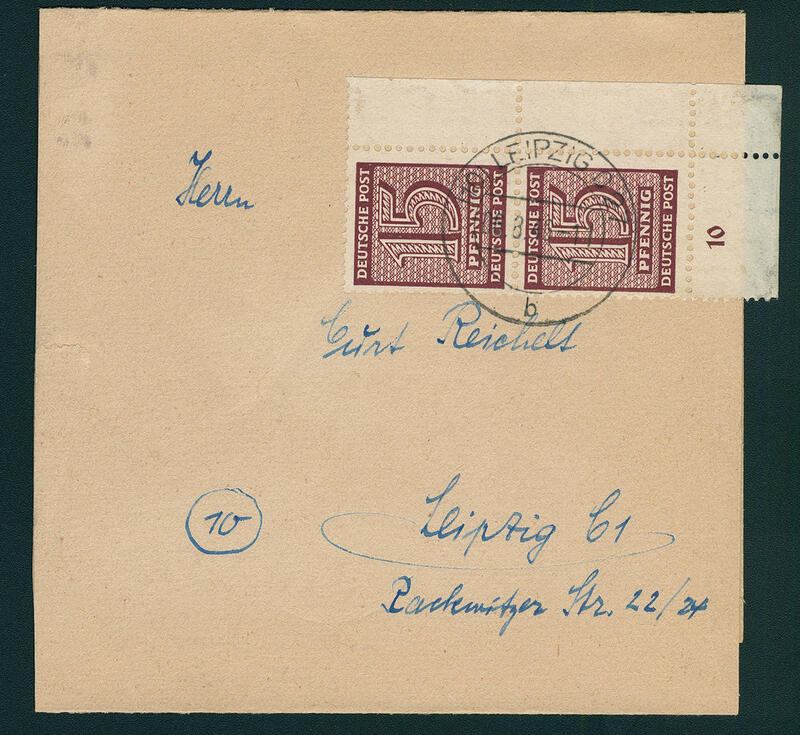 Bright red lilac, falling watermark, wonderful fresh colors and very well perforated, perfect used \"LEIPZIG 19.12.45. \", of an of the most beautiful known examples this very rarely colour, photo expertize \"genuine and immaculate\" Ströh BPP. 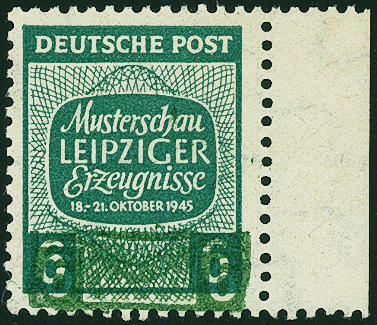 6194 Hz10U Postal stamps issue 1945, center piece 3-12-6-8 Pfg. Unperforated, wonderful fresh colors and large margins all around, in perfect condition mint never hinged in utterly perfect condition. One of the great Soviet Zone and se-tenant rarities, as only one other specimen of it has become known. The here offered center piece comes from the famous Ströh collection and was in of our 70. Auction for 6200,- €plus percentage of bid price auctioned. A premium example of this important Soviet Zone rarity, without any signs. Photo expertize \"genuine and immaculate\" Ströh BPP. 6195 Hz11U Postal stamps issue 1945, center piece 5-6-12-8 Pfg. Unperforated, wonderful fresh colors and large margins all around, in perfect condition mint never hinged in utterly perfect condition. One of the great Soviet Zone and se-tenant rarities, from the only another copy from this known is. The here offered center piece comes from the famous Ströh collection and was on of our 70. Auction for 6200,- €plus percentage of bid price auctioned a premium example without any signs. Photo expertize \"genuine and immaculate\" Ströh BPP. 6196 SZd3U 3 Pfg. Bright yellow brown - 6 Pfg. 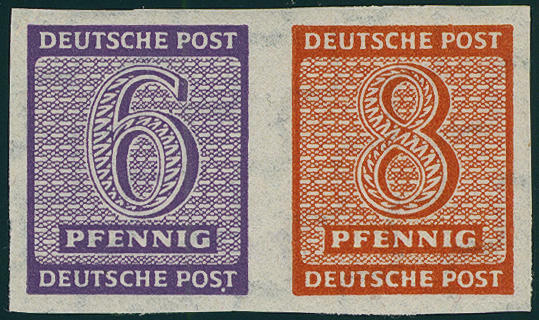 Bright gray violet, vertical se-tenant, unperforated, large margins all around, in perfect condition mint never hinged this se-tenant comes from the ombination bow 1. A SBZ-rarity in perfect condition! Photo expertize \"genuine and immaculate\" Ströh BPP. 6197 SZd4U 5 Pfg. Blackish olive green with 12 Pfg. Bright carmine red, vertical se-tenant, unperforated, from left margin of sheet, large margins all around, in perfect condition mint never hinged this se-tenant comes from the ombination bow 2. A SBZ-rarity in perfect condition! Photo expertize \"genuine and immaculate\" Ströh BPP. 6198 Wzd15U 6 Pfg. 8 Pfg. 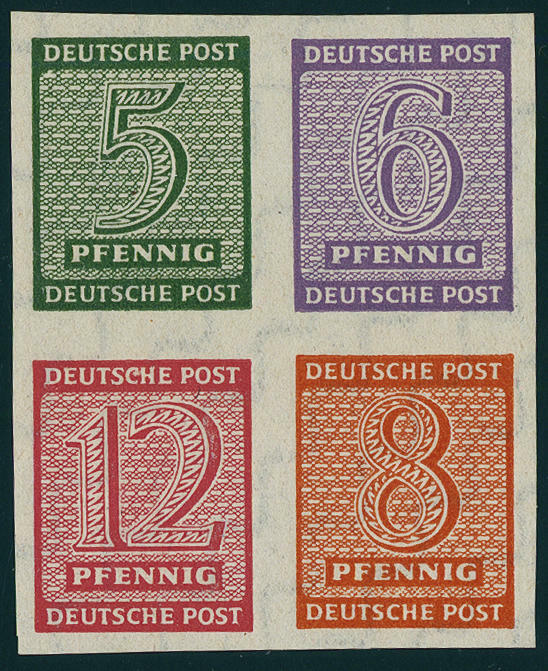 Numerals 1945, horizontal se-tenant unperforated, fresh colors and in perfect condition mint never hinged there are only few examples from this known! Expertized shrub. 6199 WZdA16U 6 Pfg. Bright gray violet Z 3 Pfg. Bright yellow brown, horizontal se-tenant unperforated, wonderful fresh colors and with wide margins, gutter like always with fold trace, in perfect condition mint never hinged this piece belongs to the all large se-tenant rarities and is only known in very few copies! Photo expertize \"genuine and immaculate\" Ströh BPP. 6200 WZdB16U 8 Pfg. Bright red orange Z 6 Pfg. Bright gray violet, horizontal se-tenant unperforated, wonderful fresh colors, large margins all around, in the gutter like always with fold trace, in perfect condition mint never hinged this se-tenant belongs to the large se-tenant rarities and is only known in very few copies. Photo expertize \"genuine and immaculate\" Ströh BPP. 6201 WZd13U 3 Pfg. Yellow brown - 12 Pfg. Bright carmine red, horizontal se-tenant, unperforated, from upper margin of sheet, large margins all around, in perfect condition mint never hinged this se-tenant comes from the ombination bow 1. A SBZ-rarity in perfect condition! Photo expertize \"genuine and immaculate\" Ströh BPP. Michel 4500,- €.